What is a liquid crystal? 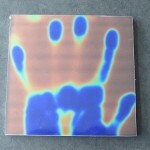 Have your students explore these unique molecules by creating and observing hand prints. They will then use liquid crystal thermometers to learn about the 3 states of matter and find out how temperature affects each state. Upper elementary students can also use the liquid crystal papers to explore how heat is transferred through conduction. They will make a connection with specific changes of state during the water cycle (evaporation, condensation).